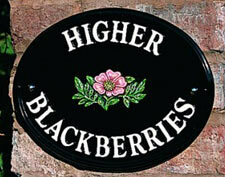 These signs are made of heavy solid brass with the backgrounds painted Black, Blue, Green or Maroon. 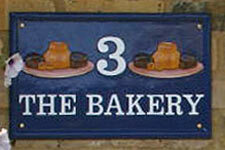 The size of lettering, motif and numbers can be varied to create a sign with an overall balanced appearance. 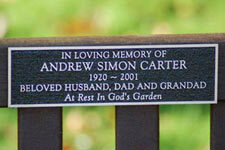 These nameplates, made from solid aluminium, are individually hand painted. They have a raised rim with raised painted letters and are available as house names and house numbers. All have a durable baked finish. 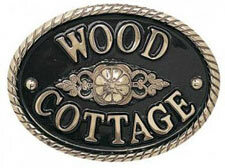 Our Horseshoe Nameplates can be used as a house sign or a stable nameplates. The horseshoe part of the plaque is moulded just like a real horseshoe. These are made from a heavy casting alloy that does not rust or corrode. 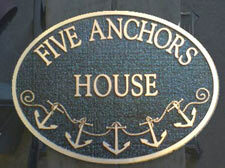 Each of the sign is individually cast using a traditional sand casting process. Molten metal is poured into a mould and alowed to cool. It is then cleaned, primed and stove enamelled.Finally the letters are hand painted on. When making the pattern we have plenty of scope to vary lettering, images and layout if you have something particular in mind. Once the pattern is made our skilled craftsmen cast the plaque using methods which date back to the Bronze Age. Although the latest technology is used to make the pattern, the casting methods is still very traditional. When making a pattern we do have scope to vary the layout lettering and include images.